Tomorrow, 12th March, 2012 - Dinosaur Train from The Jim Henson Company arrives on the Nick Jr. channel! DinosaurTrain, is set in a whimsically realistic, prehistoric world of jungles, swamps, active volcanoes and oceans. 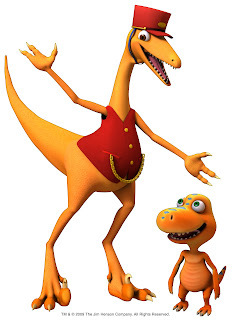 The show stars Buddy, a curious, funny and intelligent T-Rex, in a family of Pteranodons, who is cautious, but always ready to jump into action and start asking questions about the world around him. In each episode, while on the Dinosaur Train, Buddy makes a hypothesis and begins searching for the answers to his queries with the help of his mum, the Conductor and the new dinosaurs that he meets on the train. When Buddy isn’t taking exciting trips on the Dinosaur Train, he is plays with his siblings, Don, Tiny, and Shiny and anticipates their next adventure. Dinosaur Train will help children ages three to six to apply scientific thinking as they discover new types of dinosaur species, compare and contrast dinosaurs to today's creatures and embrace the living sciences of paleontology and natural science. Each 22 minute show features two animated episodes. Based on input from paleontologists, science teachers and early childhood education experts, Dinosaur Train promotes critical thinking skills for preschoolers based on an engaging and creative curriculum. Isla has been lucky enough to get a preview of the first two episodes and it has gone down a hit! She watched both episodes 3 times in one day and she has really warmed to the characters. It seems to be a perfect programme for preschoolers. One of the episodes we watched was all about team work and that's one thing that we've been encouraging a lot lately as Isla gets used to having her baby brother. I'm glad Dinosaur Train starts tomorrow, then we won't have to keep watching the same two shows over again! !